I hope everyone had a lovely weekend! I mentioned on Friday that I was taking an online calligraphy class over the weekend with Scarlet & Gold. If you’ve ever wanted to try your hand at the fancy writing style, now is your chance. They are offering another class next week, and did I mentioned it’s free? Head over to their website to sign up. When I first found Scarlet & Gold on Instagram I immediately followed them. They offer prints, apparel, and phone cases all adorned with beautiful words in addition to their webinars. I’ve never had pretty handwriting and always admired those that did, so it was without hesitation (and a lot of excitement!) that I signed up for the class. And, I’m so glad that I did! Not only did I learn something new, but I really enjoyed practicing my penmanship and getting creative with my letters. But first things first. Before the class, Scarlet & Gold sends a packet that you will need to download and print so you can practice and follow along during the instruction. It’s filled with beautiful sketches that you can frame, helpful tips about the tools you’ll be using, and some letters to practice with. I purchased all of the recommended items for the class from Paper Ink Arts. Once you’re signed up and confirmed for the class, Scarlet & Gold will let you know what supplies you need and the types to get. The basics are a nib, pen holder, and ink. Make sure you also buy the paper they recommend as you will need it to trace the letters during the class. By the end of the class I was able to write ‘Let’s Write Pretty,’ although I am by no means an expert. I think the last time I practiced writing like this was when I was in second or third grade and I was learning cursive. 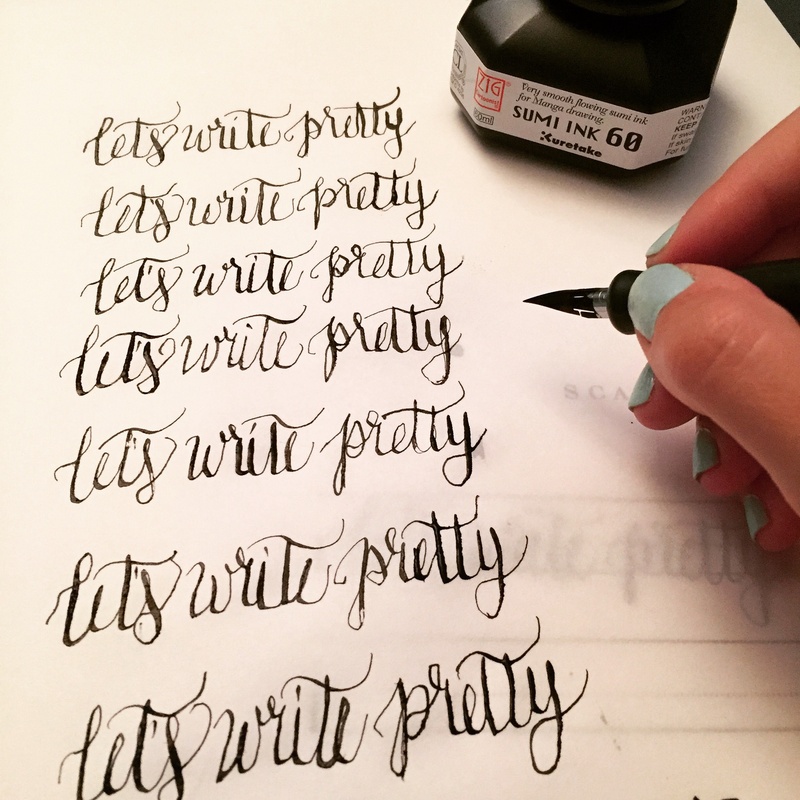 This is such a fun hobby and I look forward to continuing so I really can write pretty!